Are Tasers too deadly to be called 'non-lethal'? Police Chief John Martin demonstrates a Taser in Brattleboro, Vt. The death of a celebrity bodyguard in Florida after a shock from a Taser and another death of a Connecticut man who was tasered, have renewed safety concerns about the use of the popular stun guns by law enforcement. On Monday, Miami-Dade officers responded to the call of a fight at a home in Pinecrest, Fla., where they say they found an unclothed Norman Oosterbroek, 43, fighting with his neighbor, Markus Jung, NBC Florida reported. Police said Oosterbroek became physically aggressive with officers when they attempted to take him into custody and ignored warnings to stop. In order to stop the violence, he was shocked with a Taser. He was taken to a hospital and pronounced dead. Police are investigating whether the Taser played a role in his death, though he was also seen taking an unknown substance during the altercation his neighbor. Autopsy and toxicology results have not been reported. And the bodyguard’s death came on the same night a New Britain, Conn., man who had barricaded himself inside a third floor apartment was subdued by police with a Taser, experienced a “medical condition,” and died, NBC Connecticut reported. The man was not named and authorities have not released details of his death. 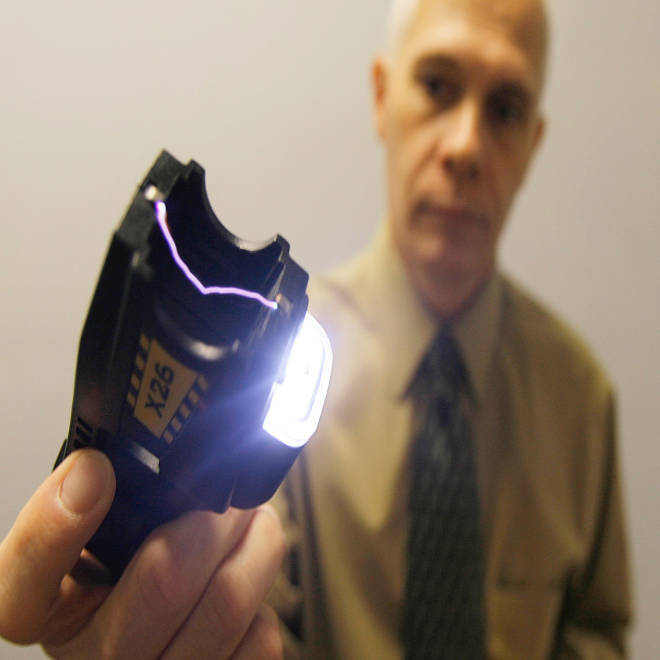 But afterward, the ACLU in Connecticut issued a news release calling for new legislation to regulate the use of Tasers by law enforcement. According to ACLU staff attorney David McGuire the man’s death shows a pattern going back nearly a decade of Taser-related deaths. “The man who died in New Britain overnight is at least the thirteenth person to die after being tasered by police in Connecticut since 2005, and the fourth in New Britain,” McGuire said. The ACLU in Connecticut, has lobbied for new legislation that calls for uniform training and the reporting Taser incidents of race and gender of anyone stunned with a Taser, saying the minorities are disproportionately the target of the weapons. Indeed, as Tasers have become the nonlethal weapons of choice by police across the country, their safety is again being questioned. According to a May 2013 report by Amnesty International, which categorizes Taser deployment as excessive use of force by law enforcement, since 2001 the number of deaths connected to Tasers nationwide totaled 540. “Most of those who died after being struck with a Taser were not armed and did not appear to pose a serious threat when the Taser was deployed,” the Amnesty report said. And while there are currently efforts at a national level to establish guidelines of Tasers, policies are spotty and created by individual jurisdictions. Each police department revises their policies on a continuing basis. The Police Executive Research Forum, which conducted a survey of more than 500 state, county and municipal law enforcement agencies, found that most agencies are trained on a “use-of-force continuum,” where officers learn to use suitable force levels depending on circumstances. He has testified for plaintiffs in Taser death lawsuits against law enforcement agencies and authored articles on their danger. “It’s obvious to me that Taser electric shocks can make the heart stop,” Zipes said. He said a tasered person’s heart can race from 400 to 600 beats a minute and send them into cardiac arrest. But Taser International, which has sold 720,000 Taser weapons around the world and supplies weapons to 16,000 law enforcement agencies, disputes Zipes’ research, saying that the medical examiners in each case Zipes studied disputed his conclusions and said the victims died from other causes. Taser, a brand name so ubiquitous it has become a verb, owns some 99 percent of the U.S. market for the type of weapon generically called a conductive energy device (CED), whose aim is to subdue an uncontrollable suspect by shocking the muscles, making them collapse. Tuttle said the company provides “world class training” to top law enforcement officers who are then in charge of training local departments. As part of the training, officers are taught to aim the weapon at an angle, below the chest. “I don’t know of an agency that doesn’t train officers on how to use it,” Tuttle said. Jon Firman, research director at the International Association of Chiefs of Police, acknowledges some people have died after a Taser was used but said a two-year study by medical experts for the National Institute of Justice confirmed the weapon is safe when used properly. The study, by a team of doctors, reviewed 1,201 instances of CED and also found no evidence of cardiac problems, even when the probes hit suspects in the chest area. Other nonlethal weapons have also been deployed and raised controversy. Police deploy pepper spray as an nonlethal form of crowd control. It a video of pepper spray use by police against Occupy protesters at the University of California Davis went viral online and fueled concern about its use and potential damage to the respiratory system. Once widely used by law enforcement, the technique which caused unconsciousness by cutting off air to the brain fell into disrepute in the 1980s and 1990s after a number of deaths. The New York Police Department banned the use of chokeholds in 1993. The riot control tools are fired from either standard firearms, shotguns in the case of bean bags, and used worldwide often to control protests. In the 1970s British soldiers used rubber bullets in Northern Ireland. Their dangers, including a case where a boy was blinded, were kept hidden by the Ministry of Defence, according to the BBC.